MP3 players, such as iPods, have revolutionized how the masses buy music and provide a compact way to carry around entire music libraries, while also reducing one’s carbon footprint. These rechargeable gadgets have popularized digital downloads and reduced the demand for CDs, making them a big win for the environment, which is music to our planet’s ears. Of course, with this eco-friendly move away from CDs, which are notoriously hard on the environment with their material requirements, manufacturing process, packaging and long-distance delivery, there are plenty of folks who now are wondering what to do with all of those old CD cases that are taking up space on their bookshelves. The key, of course, is to recycle, which leads to the question of where exactly this CD case recycling happens. Some CD cases have a recycling code, which most often consists of a triangle with a 6 inside and PS underneath. This lets us know that CDs are categorized as type 6 plastic – aka polystyrene. This type of plastic is not often accepted for pick-up in curbside recycle bins in most cities, but using a site like RecyclerFinder.com is an simple, convenient way to locate recycling facilities that accept CD cases. This makes it easy to do your part to save the planet and helps you get rid of all of those old cases that are no longer needed. Phonebooks, waste of paper or valuable resource? Phone books are less of a waste of paper today than in the past, but they are still far from being a valuable resource. Even though the phone book industry’s consumption of trees has been reduced thanks to recycling, the equivalent of five million trees a year still get cut down just to produce White Pages. In addition to the paper that they consume, phone books also damage the environment through the fuel used to run the vehicles that deliver them. Given the prevalence of internet connections on desktop computers, notebook computers, video game systems, tablets and smartphones, the phone book is a product whose time has passed. Acknowledging this, the phone book-printing industry has created a website to allow customers to opt-out of receiving phone books. Going beyond the industry’s attempts, a number of third-party sites have sprouted up across the Internet to call for a complete end to the printing of White and Yellow Pages. Those who receive undesired books can easily recycle them. Because they are printed on regular paper with non-toxic inks, they are easy for the recycling industry to accept and re-purpose into such things as egg cartons and cereal boxes. Recycling phone books helps save trees and minimize the environmental impact of phone directory printing. As part of their green project, the engineers at Massachusetts Institute of Technology, MIT, have invented a way to print solar cells on regular paper. They have experimented printing them on paper such as tissue, newsprint, and printer paper with success. Fabric and thin plastic can even be used. The printable “ink” is made from common elements and, therefore, environmentally friendly. The process is not as simple as putting the special ink in your inkjet printer and printing out your very own solar panels. Printing must be done in an airtight room, or vacuum chamber. Five successive runs through the printer must be done using a mask made of paper on top of the paper bring printed on to form the patterns of the cells. In California, Nanosolar, a green technology company, developed an ink that they could use to print solar panels on thin, flexible foil resulting in a lower production cost. They began assembling and selling the solar panels in 2007. Konarka, another green technology company, came out with a printable solar panel in 2008. They replaced the ink in an inkjet with solar cell material and paper with a thin sheet of plastic. These panels are being used in indoor sensors and small radio frequency identification devices such as the price tag readers used in stores. The MIT engineers have not been able to produce enough power with it, however, to power more than a clock or other small electronic device. They are working to improve its efficiency. If they succeed, it is possible that someday, in the near future, it might be used for lightweight batteries, to power a cell phone, or even to power your printer. Few people actually pay attention to the damage to the environment that occurs when golf courses are built. This is not due to apathy or stupidity – it is simply the result of ignorance of and lack of information that surrounds the topic. With increasing awareness and concern for the environment, many people are coming to terms with the idea that many of our modern conveniences, such as courses for golfers, are actually causing more harm and costing us more in “green fees” while much better alternatives are available. This is in fact a very pertinent topic as golf-related tourism is increasing around the world. This sport is spreading to many countries where the ecology is sensitive to change, and this heralds a new era for environmentalists as they try to combat the spread. These courses are particularly damaging in the sense that while they may look green, natural, and appealing to the eye through landscaping efforts, they actually wipe out all pre-existing plants and animals in favor of a landscape devoid of true nature. This leads to a false dichotomy – it looks like the outdoors, but golf courses are as far from nature as a sprawling asphalt parking lot. To build a course, investors choose a site that is appealing to golfers – many of whom are in the upper and middle classes. Traditionally, these sites are around or within sprawling suburbs, but recently, a new form of golfing courses has emerged that caters to a sense of exoticism. Courses located on mountaintops, in jungles, and by coasts are becoming increasingly common as they attract huge numbers. These present many environmental problems as these areas are especially sensitive to destruction. Once a site is selected, regardless of where it is – the landscape is decimated in an attempt to open up the space so needed for golfing. Trees are scythed down and the soil is churned up, destroying the homes of birds, mammals, and insects alike. All courses call for tightly manicured lawns – this signals the most pervasive form of environmental damage in the business. In order to grow the unnaturally vibrant grasses for golf, pesticides and fertilizers are used extensively. The grass is of an unnatural variety, unable to grow without close tending. It demands incredibly high levels of water, which is sucked up from the surrounding water table and causes a high loss of water to the nature surrounding the courses. In turn, the pesticides and fertilizers dumped on the grass dissolve into the ground water, causing extensive pollution of the ground water, and surround lakes and streams. This sport is far from being ecologically friendly. It kills plants and animals alike with ambivalence, and the end result is a destroyed environment. Greater alternatives to outdoor activities would be simply purchasing land to preserve in its natural form, for use as a hiking, birdwatching, and nature refuge – not destroying it for something that only cheaply imitates the outdoors. That all sounds great and everything but I’m not willing to give up my golf game. After all is said and done, new course architects and designers are slowly starting to address and accommodate environmental issues with respect and designing courses with drought resistant plants, grasses that require less pesticides and water, and even integrating the environment into the course design reducing the need for terra-forming. Now if they can only make the fairways wider and the holes bigger! A generation ago, when classroom wastebaskets were filled with worksheets and empty lunch packaging, there was little emphasis on recycling or preserving the environment. Today’s schools have made big strides towards becoming green. Most have a standard recycling program throughout the building, and many teachers include environmentalism in their instructional units. Today’s students are taught to recycle, reuse and to conserve. A typical school recycling program includes colored bins in classrooms and common areas where students can place plastic, glass and paper. Many schools have annual recycling drives that encourage students to bring in aluminum cans or other recyclables to help raise funds for the school. During lesson time, teachers also encourage reusing containers and paper for projects or note taking. These steps have made recycling a normal part of the student routine. Elementary students also learn about caring for their environment in other ways. Taking a cue from First Lady Michelle Obama’s kitchen garden, many schools also introduce children to the importance of protecting our environment through hands-on experience in a class garden. Students may participate in preparing the soil, selecting and planting seeds, watering, weeding and harvesting the produce. Environmental field trips also help to reinforce young students’ awareness, with nature center and forest preserve visits becoming more and more popular. The quintessential zoo field trip has become focused on the plight of endangered species and practical ways students can contribute to their conservation. Through school wide mandates, classroom lessons and field trips, today’s school children receive a comprehensive education in how to reuse, restore and conserve the earth’s resources. Tea Party at the landfill anyone? Relaxing with a cup of tea is just about as good as it gets. A few moments of steeping and the tea is ready to drink but how should a person dispose of the used teabag and now empty packet? There are several options for ensuring tea waste is disposed of properly. While yes, empty packets and teabags are not going to overrun the landfills on their own, there are so many environmentally friendly options available to recycle or even reuse the packets. Some varieties of tea are packaged in foil-lined packets. These packets are not considered paper in terms of recycling and are not recyclable in most areas. The greenest option for the environmentally conscious tea drinker is to change to a brand of tea sold as loose-leaf or packaged in plain paper packets suitable for recycling. There are countless ways to keep foil-lined packets from ending up in a landfill. How about reusing those foil-lined packets to store seeds? The foil blocks light and prevents moisture from reaching the seeds, making them perfect for storage. In the spring, use the packets to start the seeds. The foil lining helps retain moisture in the small amount of soil held in the packet. Other options include numerous craft ideas. Kaleidoscope folding with empty packets makes unique embellishments for use on scrapbook pages, cards and other paper crafts. Use a variety of empty tea packets to decoupage a box or canister. It could be the perfect place to store recently purchased loose-leaf tea. Theme parks aren’t known for their recycling efforts or for attempting to reduce their carbon footprint. But with recent developments it seems that amusement parks are starting to do their part to keep the world as green as possible as long as possible. Major theme parks like Six Flags and Disney World have started recycling programs in order to keep the millions upon millions of plastic cups and the like out of landfills. Some amusement parks have even switched to biofuel to fuel rides and machines, friendly cleaning products and locally grown ingredients in their eateries. An online company called Green Halo Systems allows users to track what they recycle and where it’s going. What this means for amusement parks is that Green Halo software will give them the ability to see what they waste and how much they waste. Now companies can see first hand the impact they have on the environment rather than having to make an educated guess. Any data from Green Halo software can be shared with multiple users and can also be printed out. Other efforts some theme parks are making to go green are using LED lights, switching to water-saving fixtures and switching from plastic trash bags to ones that are biodegradable. For many of us, an amusement park is one of the last places that we could think of as going green, but why not? It’s place where a large amount of people gather, eat and walk, which can add up to quite a lot of trash in a short amount of time. Amusement parks are doing their part to keep the environment intact, make sure you’re doing yours. Every year, Americans damage the environment by purchasing and throwing away over two billion disposable razors and razor blades. That means that billions of these pieces of plastic are going to waste and piling up in landfills across the country year after year. The negative impact on the environment could at least partially be avoided through recycling. Cutting down on waste may be a matter of choosing to recycle a razor or purchase a razor that is made with recycled materials. Some shaving companies are now running programs that allow consumers to send back their used blades and handles to be recycled into new products. 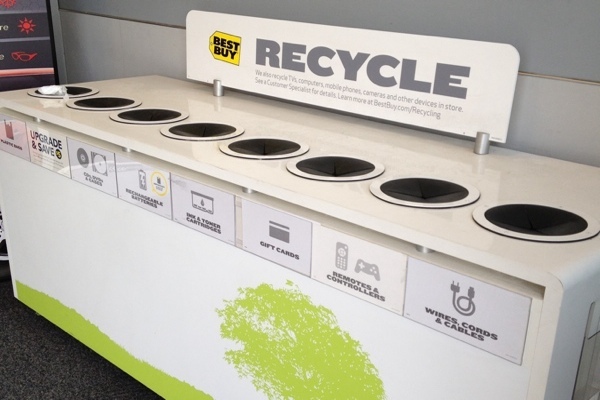 The most environmentally-friendly businesses offer a combination of recycled and recyclable handles, with handles made of 100 percent recycled materials that can also be sent back to the company to again be recycled. Unfortunately, it is not possible to recycle blades in the United States unless the shaving company is specifically running a program in which they allow consumers to send back their used blades. Currently, there is one company in the United States that is actively advertising their ability to recycle a used razor. The company, located in Massachusetts, is called Preserve and specializes in American-made personal care and kitchen products that can be recycled. Some consumers purchase disposable razors because they cannot afford the purchase of a high-quality, reusable razor. Consumers that find themselves in this situation can cut down on waste by taking steps to make the razor last longer. Rust is a common problem with disposables, so it’s important to dry the blade shortly after use. Keeping the blade sharp and free of rust is a matter of storing the blade in olive oil when it is not in use. When astronauts travel into space, they carry along air and water. Volume and weight restrictions limit the amount of supplies that can be carried, so water must be rationed and recycled. This is especially important on long missions. Extended stays at the International Space Station would not be possible without careful recycling. Water recycling has always been employed at the space station. It is not a glamorous aspect of being an ISS crew member, but astronauts must even recycle urine to preserve limited drinking water supplies. Recycling equipment on the ISS is a system of modular components. A separate water processor assembly and urine processor assembly function together as the water recovery system, and the water recovery system is part of the larger oxygen generation system. These systems function together to produce enough air and water to support seven ISS crewmembers for extended stays in space. If manned space exploration is to progress further, size and efficiency of recycling equipment must be optimized. Preservation of all available resources will be critical to interplanetary travel to Mars or the establishment of a lunar colony. The technology ultimately used must be able to sustain astronauts for a period of three years without external resupply. Researchers are working steadily on several different approaches to recycling. Some efforts focus on mechanical processing, while others use chemical reactions to reclaim oxygen and water. Some research even focuses on bacterial processes, similar to those used at wastewater treatment facilities on Earth, to produce air and drinking water. In the past, when shoes became unwearable, they were thrown away or taken to the landfill where they added to the existing piles. Today, recycling is a friendlier solution for getting rid of worn-out footwear. Not only does this create a cleaner environment, but the components produced through recycling can be used to create new products. This process prevents landfill overflow and creates an atmosphere of stewardship and sharing among societies. How do people get started? The easiest way to recycle footwear is through a program like Nike’s ReUse a Shoe, which breaks them down and uses the resulting nylon, rubber, and foam to create products like Nike Grind, a component in athletic mats, or even new footwear to donate to others. Nike’s website lists over 200 drop-off locations around the world where people can bring athletic shoes and LIVESTRONG wristbands to be recycled or donated. While Nike focuses mainly on preserving a trash-free environment, other programs such as Crocs Cares, Soles4Souls, and the Cinderella Project focus on donating. These organizations collect worn Crocs, athletic footwear, and high heels to donate to impoverished communities across the globe. For example, Crocs Cares donates Crocs to developing nations to prevent the spread of disease; the Cinderella Project donates formal evening wear and accessories to teenagers who cannot afford them for proms and formal dances. Websites for each of these groups list locations and contact information for donating gently used pieces. Finally, for those who wish to recycle within their local communities, Recyclerfinder.com provides a free application for computers and mobile devices so people can search for nearby facilities. Plenty of options exist for turning shoes into usable materials or for donating them to a worthy cause, both of which keep them out of the landfill and on people’s feet where they belong. Find places to recycle shoes at http://www.recyclerfinder.com.